Listen to the wide. Things will go smoother in the long run. You can always lower the price if it doesn’t sell at $250. All depends on your demographics. Around here $175 would be a good price. But, we’re in a depressed area. As MKH said , price it at $250 and see. This being a rather simplistic construction piece, you might get away with 2x materials cost. I spent roughly $70 on material and a couple hours time. Im not looking to get rich off of these maybe just sell enough for new toys in the shop. 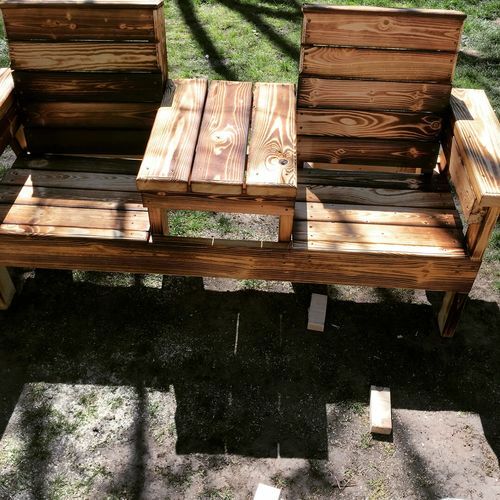 Nice looking outdoor piece of furniture. It doesn’t look too comfortable to sit in, which might have a bearing on the price you can charge. Sold one for $375. But I used cypress and expensive finishing material. They were happy with the price. Sell for too low and you’ll get sick of it pretty quickly, it won’t be worth it. I would shoot for $250. But it looks overbuilt, might be able to slim it down and make it easier to move (both ways). This would look mighty fine at the end of my dock. Nice and heavy, won’t blow into the lake. I would drill a couple holes in the table and insert recessed cup holders like you’d find on a boat. If you make 3 of these benches in an assembly line fashion maybe you could sell them wholesale to a marine dealer that sells boats docks and lifts for far less than $250, as low as you could go and still make some money. This in addition to your own direct sales might be a great little side gig. Nice work! I still struggle with this all the time, it sounds like you’re undervaluing your efforts. I’m guilty of the same and it’s a tough habit to break, price it at what the market will bear and be able to justify your cost. You have your location listed as “up north” where if that’s north Hampton’s on long island, that’d be a real deal, if it’s north of Youngstown, might be a bit tougher sell. Finding comps in the area will help guide you. I still struggle with this all the time, it sounds like you re undervaluing your efforts. I m guilty of the same and it s a tough habit to break, price it at what the market will bear and be able to justify your cost. You have your location listed as “up north” where if that s north Hampton s on long island, that d be a real deal, if it s north of Youngstown, might be a bit tougher sell. Finding comps in the area will help guide you. I live in Minnesota lol. I priced them to sell here to check the market. I priced low enough to cover cost and put some change in my pocket but not much. Next time I put these up the price is going up a little. if you have any lakes around that have a lot of vacation homes, that would be a great place to try and sell. i lived on a lake with about 1400 homes around it and 11% of the people were full time residents. theres was a party store on the lake that the owner let me set up some patio/dock furniture up for sale at. kept me busy and i made some $$$ in the summer- folks with vacation homes have a tendency to have disposable income. If 2 hours of time and $70 in materials is the true cost to you—then I think $250 is a fair starting price. Based on demand you can always raise/lower the price. 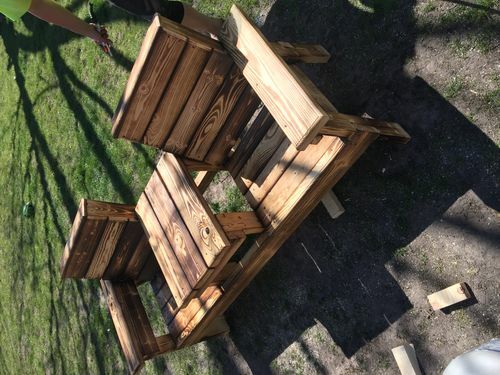 This looks like a substantial, solidly constructed piece of outdoor furniture made from framing type lumber (2x). It has a blocky, Minecraft-like appearance—perhaps a few more curves or more rounding of corners/edges might soften the appearance? It might be nice if there was a hole for an umbrella in that center section. I prefer stain/poly or paint to the burnt finish. I’ve never sold anything I’ve made, but if I wanted to price something I would start with my costs (time and materials) and add at least 25% for profit. It seems to me that it will always be tough to compete on price with some factory (or cheap labor market) that can churn out mass quantities at low cost—a significant value that you offer is the ability to customize (size, shape, materials, finishes) as well as be accessible to and/or interact directly with the consumer.